There are summer days when I wake up and walk outside and glory in the beauty of the season. And then there are days like the ones last week when I throw myself into a snowbank if one materialized. And so was born the idea for a book about winter and summer that celebrates each season. Summer can be read on the glory days of summer and the bitter days of winter and vice versa. This book is based on the form called dos à dos meaning back to back in French. I used copy paper with writing on one side and had the writing on the inside when I made the first hot dog fold. Two hot dog booklets are glued into a cover that has been folded like a Z. If you've been following the blog, you may already know how to make a hot dog booklet. If not, there are written directions in English and Spanish and a video tutorial. 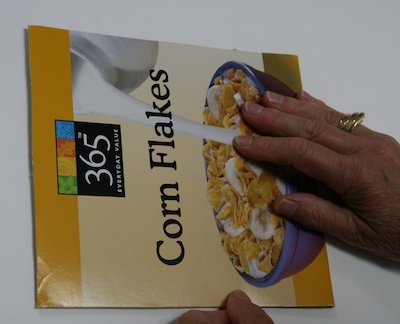 For the cover, you'll need the front or back panel of a cereal box. The length should be at least 3 times the width of the books. 1. Place the cereal box panel so that it is wider than tall. 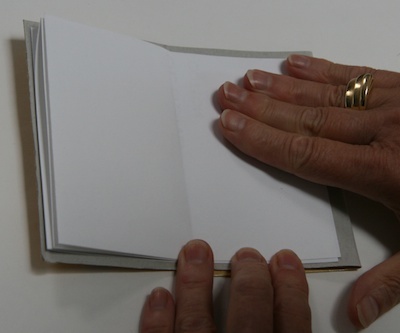 Leaving a small border at the side edge and the bottom, place a booklet at one edge of the panel. If you are doing it with a group, choose right or left so that everyone is doing the same thing. 2. 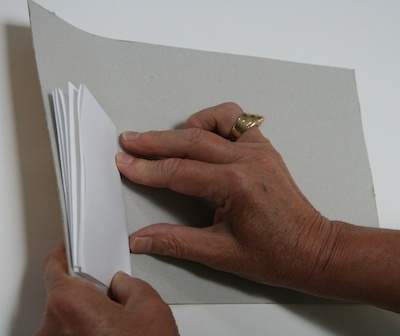 Fold the panel over the booklet and flatten. 3. Turn the cover over so that the booklet is underneath. 4. 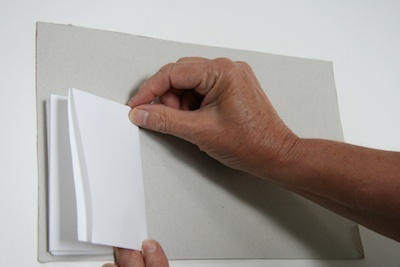 Flip the panel back so that the fold likes up with the edge of the previously folded section. 5. Trim off any excess cover. 6. 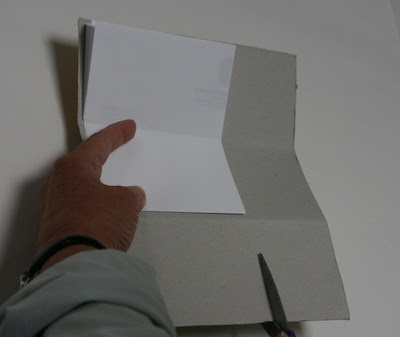 Hold the booklet in place, open the folds and trim off the top leaving a small border between the booklet and the cover. 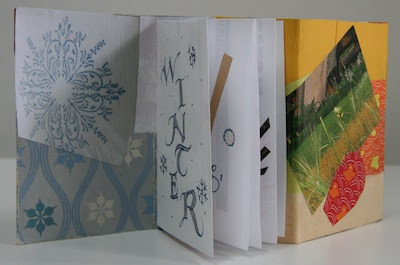 In my Summer Winter Book, I decorated the cover with collage papers before attaching the booklets. 1. 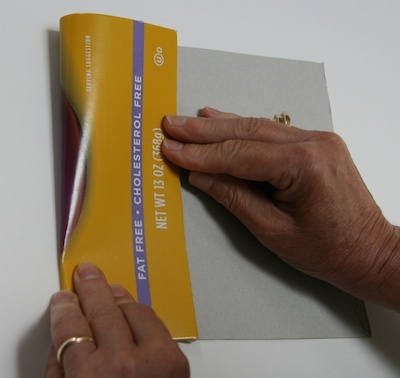 Open the top page of the booklet and insert a piece of scrap paper. Cover the surface with a thin coat of glue. Remove the scrap paper and fold it in half. 2. 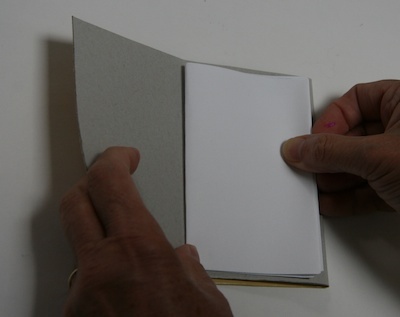 Place the booklet in the cover so that the spine (the side with the single fold) is along the fold of the cover. 3. 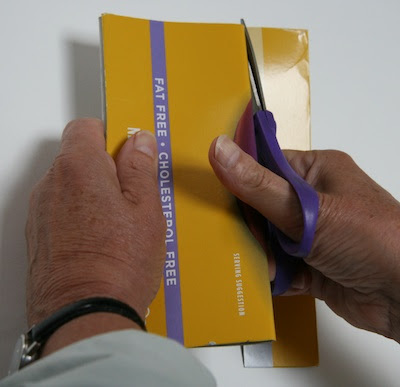 Open the booklet and smooth to help the glue adhere. 4. Turn the book over and repeat on the other side. This book has a lot of curriculum applications—contrasting points of view such as the Union and the Confederacy in the Civil War or characters in a book and any debate topic. View my book on flickr. 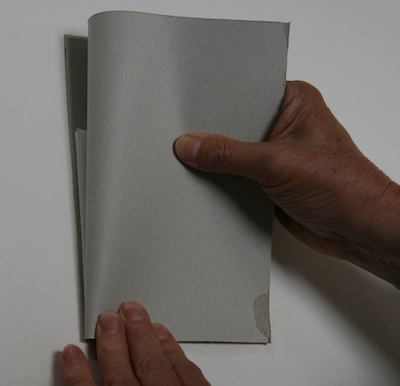 Leave a comment and be entered into a random drawing for a copy of the Lark Studio Series Handmade Books. That is a wonderfully clever, easy dos a dos book. Most of the books you demonstrate are easy to make, which means that I should stop reading and start creating. :-) Thank you for the inspiration. I love this idea of dos a dos. Thank you for sharing your clever ideas. Please enter me in this wonderful draw. You can never have too many books. Fabulous book! Easy enough to do with my grandchildren and interesting enough to do with my senior citizen groups. I agree w/ you; it's so wela (hot) & humid in HI - daily sauna! Then tradewinds caress, so cool and refreshing, paradise...a lilikoi (passionfruit) shaved ice helps, too. Mahalo for sharing an EZ dos-a-dos that I can try w/ my haumana (students). And maybe win the book w/ more ideas, also. Thank you. So happy to learn about this new way to utilize some of the box fronts that I have been saving! fun project for any get together! I look forward to the new changes you mentioned. I am always inspired by your blog ideas. Thank you for all you do for us. I am amazed at how versatile the hotdog booklet is and all the variations you come up with! They are simple to make with children or anyone who has never made books, it's a great way to recycle boxes and computer paper and they make a great activity for kids parties. Thanks for coming up with these fun books! I love this idea of making opposite books..Last week with the hot,humid Ct weather the local news channel showed photos of last winter's snow. Seeing the opposite makes one appreciate both. Thank you! I've also used this book as a sketchbook. We use one side for the first quarter and the other side for the second quarter. Thank you Susan! I always love checking out what you are doing next! Can't wait to spend some time during this continuing hot week looking at "Great Blizzard of 2011" pictures for inspiration for this Summer/Winter Book! Thank You for this idea! Perfect for my next book lesson I teach my friends girls at our "book camp" this Summer! Easy Peasy. thanks for showing us how to use materials we already have. This will be great to use at pre-school to help teach opposites. My class and I used your site often last year. Everybody loved making books but the person who loved it the most was my most problematic student. When I needed to get him engaged we would talk about/begin our next style of making books. He even did it at home with his mom. Bless you. If you ever come to Austin you've got a free place to stay. Don't come now of course because the heat and drought are horrific. I've been following your Blog for sometime now and find lots of inspiration, you must have quite a follwing. So pleased to enter your Giveaway for Handmade Books. Wonderfully inspiring ideas for my K-5 art classes. I absolutely love your blog. Thank you Susan. I also like to read the ideas from the posts, and will use this as a sketchbook for 4-5 and opposites for primary. Fantastic ideas always. Love your inspiring books for my K-5 art classes. This one will definately work. I read your blog and your site for a while now, from Buenos Aires, Argentina, and it's always inspiring and happy to see your art, and your ideas! Thank you for sharing! I love making books and share my skills voluntarily with the community. I often work with abused women, I can see this would be a great way to explore some of their confused feelings. And as ever you have made a tricky structure so simple - thank you! This book will be perfect for my first grade class! Thanks as always for the inspiration. The giveaway book looks great. Hope I win!!!! Thank you for your work. I love books you made and use it with kids in our homeschool. Thanks for the directions for a great book construction! I am to teach a book project at an upcoming ladies crafting day at church...need to do something cool but simple. Appreciate you sharing your ideas here. A wonderful idea for the classroom. And, oh, how I can relate to the desire to escape into winter! Each summer I wonder why I haven't left Dallas. Whew! I appreciate the way you are always finding new ways to communicate your ideas to us! I often use your video tutorials, but these step-by-step instructions with photos will be perfect for my inspiration file! Thanks! I love it! What a cute idea. And so versatile to be used for so many different curricular objectives! The Summer-Winter book is such a lovely idea for a gathering of friends, daughters, first graders... thank you for showing us this simple device that will evolve into so much more! I too love to use cereal boxes in bookmaking. I use them for templates, practice models and soft covers. This is an elegant application of the hot-dog book. I am going to use it in my art classes. As always, thank you, thank you! 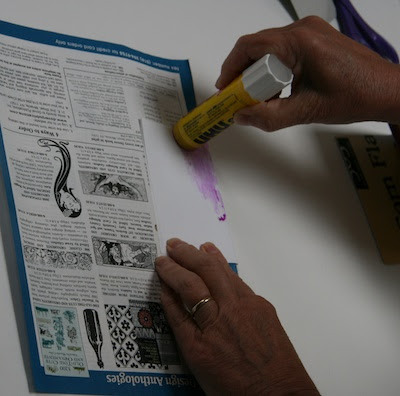 This is another lovely, original idea to introduce children to the idea of making a beautiful book from the materials many of us discard in our recycle bins. Thanks for the continuing inspiration! I love this idea and am definitely adding it to my library book-making ideas. I have used several of your ideas with my students during a too-short library time, and they really enjoy making and taking these books. Thanks for another idea!! Loved the post, thanks for the instructions - they are SO clear for us visual learners. Also, drop my name in the hat for the book. It's one that I don't have and would love to own. A great tutorial--nice step by step photos. I'm excited to try this with my kids. Thanks for the tutorial! Lots of great applications for this type of book with younger children as well as older. Almost any pair of opposites will work: in/out; up/down;thoughtful/thoughtless (for older kids) etc. Thanks for the easy-to-folloiw directions! Very smart!!! I'll make one sample and propose it to my pupils in september ;) it will be a very good idea, as Jane pointed out, to make with every sort of opposites! you always have such interesting ideas. 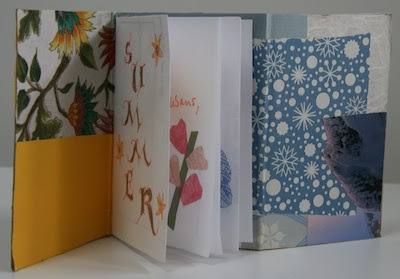 I teach Simple Bookbinding for a senior citizens group and this fits right in. Thanks for the great book ideas each month. I love the simplicity of your ideas. I just went on a garden tour with a couple of my librarian friends, we could have used this little book to name plants we would like to buy and a little sketch and on the other side list the books we want to read. A perfect memory of a garden book day. Thanks Susan for all your inspiration! Right now, shivering in a New Zealand winter, and reading on the internet about the hot summers of all my northern hemisphere friends makes this book most apt! Oh, I so wish that I had found this site years earlier when I was teaching. I did make different books with my classes but not all the styles that you have shown. The classes liked making their own books this site would have provided many more styles to increase their creativity. I still have many friends teaching and would love to win your book for them. Thanks for all your ideas. You keep on surprising me with your creativity, Susan. I love your projects and books. And something I really like about all this: recycling paper! Another great idea! I teach 3rd and 4th grade and have made at least 4 different books of yours this last school year. One of next year's projects will be the Poetree. Thanks for all of your ideas. As we are in the grip of winter this would be a perfect project for my class to try. They love making their own books. Thanks, Susan, for another great book idea. Your books always make great little gifts for my grandchildren. They are always anxious to see what new styles you have taught me. Thank you for your nice blogs and giving us new and new inspiration! Great way to teach creative recycling/repurposing at an early age. [And a clever way to get distracted from the heat ...] Thanks! I make lots of books for the children in my daycare and this is a GREAT idea to compare two different things:summer and winter,big and little,fast and slow, hot and cold,etc. It gets kids thinking and they want to make a book of their own. Kids who make their own books tend to want to read others books!! It's so exciting! I love the way you feature re-cycled materials. Plus the idea of making books of opposites is a great use of the dos-a-dos structure. I love making books, esp. with kids at camp. And cereal boxes make nice firm covers. Always looking for more ways to make them, and love your ideas! Thanks again Susan for inspiring us. I did my first dos a dos book with shereen la plantz years ago. This was a great reminder and perhaps a good one for using next year with my kids in havana again. Thanks for the great idea. I can't wait to try it with my classes (I teach art). This is going to be the year of the book; whenever they finish early, I will have a short book project for them to do. I think they will love it. Love the versatility of the compare/contrast book...I'm sure kids will like the challenge, as well.